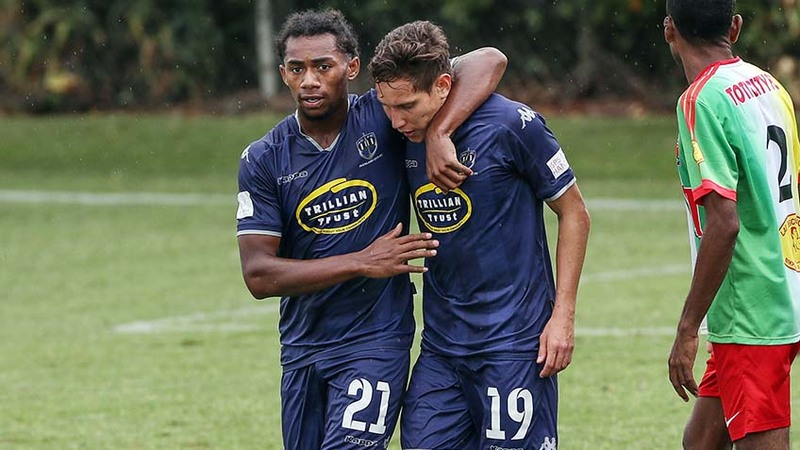 AUCKLAND, New Zealand - Auckland City FC are through to the semi-finals of the OFC Champions League after a 4-0 trouncing of Lae City at Kiwitea Street today. A hat-trick from Papua New Guinean international David Browne and a headed goal by All Whites defender Te Atawhai Hudson-Wihongi were enough to see the Navy Blues through on a wet day in Sandringham. It was a special day for skipper Angel Berlanga who made his 200th club appearance for the Navy Blues in the same week he became a father for the first time. Lae City were eliminated at the same stage of the competition last season but they were far from an easy beat today as coach Peter Gunemba set up a disciplined and organised side designed to frustrate the hosts. But those plans went out the window just before halftime when Browne latched onto a Manickum pass to lift the ball over an advancing Ronald Warisan just before the break. Browne added his second with a piece of individual brilliance mere seconds after the restart before Hudson-Wihongi headed home a Fabrizio Tavano corner unchallenged to make the match safe. There was still time for Browne to complete his treble when substitute Reid Drake threaded through a brilliant pass for his in-form team-mate who left Japhet Tiampo in his wake before slamming home a superb finish. Auckland City FC had two stick on penalties turned down by referee Medric Lacour who had an otherwise solid game in what the hosts will view as the ideal response to their disappointing ISPS Handa Premiership semi-final exit at the hands of Team Wellington two weeks ago. The Navy Blues will travel to face either Central Sport of Tahiti or a rematch with New Caledonia's AS Magenta in the last four in the last weekend of April. AC: 1. Enaut ZUBIKARAI (GK), 5. Angel BERLANGA (c), 7. Cam HOWIESON, 8. Albert RIERA (16. Yousif ALI), 11. Fabrizio TAVANO (17. Reid DRAKE), 12. Dylan MANICKUM (22. Omar GUARDIOLA), 14. Jordan VALE, 15. Dan MORGAN, 19. David BROWNE, 20. Te Atawhai HUDSON-WIHONGI, 21. Maro BONSU-MARO. SUBS NOT USED: 18. Ruben PARKER (GK), 2. Darren WHITE, 10. Micah LEA'ALAFA, 23. Alfie ROGERS.